By the same guy who found the original triple-abx cocktail that seemed to kill all tested forms (for at least the strain they were using). That was interesting, how they talk about oregano, cinnamon bark, clove bud. That paper is mad-long. I just started the oreganol and I think it works better than Japanese Knotweed powder, I am beginning to think it is better to use the tinctures. But I just got the Turpentine made from the days of what you read in the Merck Manual. After some study I am convinced it is supper strong and safe 2 X a week. 90 year old lades have been taking it all their life for all sorts of things. I am doing 5.10s now but my shoulders are somewhat sensitive. I think that should improve over time now that I am using all these different kinds of Oregano. I am adding the breathing and turpentine just to be safe. I could not eat the whole plate, it was too hot. You know you have the right recipe when sweat is pouring down your face and the salt is getting in your eyes while you're eating. Jalapeno peppers, red onions, garlic, ginger, bell peppers, 3 eggs, Himalayan salt, turmeric. Juiced carrots and beats. No bread if you can help it, if not white gluten free, no milk, no oil-use butter in the pan instead as well as on the salad. You guys need to build me a Monument. Where are you going put it? I recently discovered that there is a big difference between a raw onion and a cooked one. I am now eating my bell peppers and onions as raw as possible, I steam them a little. I was amazed at how hot a slice of onion is as it goes right through the top of the head. I think this is a new breakthrough. On gluten free bread I put a big slice of onion along with garlic etc. Take a look at this: Yes there is a once and done cure for athlete's foot. Given as how an infection especially in older people can be next to impossible to cure this - to me - seemed almost like a divine revelation. I'd been doing some research on the topic. Apparently I am aging and the Doctor's pill the Lamisil the Lotramin the chlorine and vinegar soaks - yadda yadda all of it is mostly useless for me especially in winter when I gotta keep my feet covered because it's friggin cold and - - wouldn't you know it sometimes my feet perspire and - - - well - - - it's a vicious cycle. Anyway: Gasoline. Yep, that's the cure. The Ancients used turpentine. I suppose mineral spirits would work about as well. One 8 - 10 second soak and the fungus is gone. Gone. I even have a concurring result from a Physician who had an incurable case of it and tried Gasoline.He published it in a letter to the editor in JAMA. April 11, 1931, Vol 96, No. 15 http://jama.jamanetwork.com/article.aspx?articleid=253566 So when people tell you that a cure takes a week or more just smile and whip out that gas can. When I was a kid Kerosene was the magical instantaneous absolutely sure fire cure-all for parasites like lice and crabs. That too was once and done. Symptoms: Hay you guys, starting from Sept. 26th post till now that's over 60 days, so far so good no symptoms, no swelling. I admit did have a little pain in my pointer joint a few days ago, but took some of my tinctures as usual and the problem went away right away. I admit I had a cramp in my foot driving to Trenton one day as well. I wear tight boots sometimes ... I took some tincture did some walking and it went away right away. Cramps are a symptom, although I was wearing tight boots that I solo in, I solo in hiking boots, easy climbs. That was two times in 61 days, something is going on here! I have indeed risen from the dead! Sitting: Now guys, I have been very busy writing a book. So, during this time I been sitting doing nothing for pretty much all of November and December, I admit I went to the gym on 28/11, 30/11, and December 4th 17th, 27th, 29th, 30th. I did not do anything that intense, a few climbs, and did not stay for more than an hour or two. And I also rode my bike maybe 4 times about two miles and walked around in the subway for a few hours. Not much exercise at all. No trips to the Gunks, no actual climbing. Now I can do 5.10 at the gym, some of the ratings are really off though, and yesterday I did 10 climbs for about an hour and a half. My shoulder which was cracking when I moved it is getting much better and is getting full of meat. Prescription: For the last, close to 3 weeks, I have not used the powder because I do not like the taste, which is a mistake. I think that the tinctures are more powerful, last night I had one tablespoon of Japaneses Knotweed added to water. And I had it one time before that in the last few weeks. But always do take those oregano pills as prescribed, see previous post along with tinctures. And I take collagen, I saw Lyme video on that, so I take that 2 times a day, and maybe a stomach acid pill, Betaine HCI. Cured? Ideally, I think I will stay with less meat, and a lot of garlic and jalapeno, ginger, onion turmeric. And I can back that up with some of the tinctures in case I get bit again. The turpentine, only one time a week is all I think I need if at all, I have not been doing that so much, that stuff scares me. But the clove bud tastes a lot worse. And I will in fact take it with the Japanese Knot-weed twice a day for now because it numbs my tongue so I do not have to taste that awful dirt. The other powders I think are optional at this point. Not sure if all the bugs are dead, I have my doubts, so I am going to increase my dose when I get the Lyme tincture of Japanese Knotweed combo I ordered a month ago. So I think I should include the Wim Hof method in my daily routine of spicy food, tinctures, and some powders. These people are heavily dependent on the Wim Hof method, so add to that all of the above what is left to do? I was thinking a next step would be to deliberately introduce different stains of Lyme into my body, and I think I could do this and be successful. But I think it is much better that if some of you guys who are already in the greater chronic points in the disease, who are willing to stop the prescription drugs, can use the above methods. I would not be willing to take my self all the way back to a chronic point and start over from there and that is where the real starting point should be. If you have some permanent damage already that is a greater challenge, but it should allow your immune system to kill all of the bugs and do a lot more then anything else will. "Can you give me a breakdown Donald of the 'dosages' of the herbals that you're taking that you've got in the picture there?" For the powder: One table spoon of each 3 times a day is necessary. For the tinctures coupled with oregano as prescribed, 4 capsules of each bottle, two times a day. The more you do the better, at this point I am getting sloppy with the Japanese knotweed and other powders I started out with. My theory is you can only go so far with the powder, but the tinctures and the oregano and (onions-garlic-peppers-ginger-turmeric-eggs-for-breakfast) work better. I would use both if I was starting over from scratch, starting with turpentine. Is anyone curing Lyme with this method here other then me? Gasoline also has about 15 known, not suspected, carcinogens in it... Although it very well may be a potent antifungal, so is plutonium. You don't want cancer on top of your other issues. Two of the Lyme patients I know have done very well with biweekly injections of Bicillian. This was after years of much heavier and more dangerous IV meds such as Rocephin with a central line. Current theory is for some this will kill the easy mobile Spirochetes off but does nothing for the spherical and biofilm forms. So it's basically treading water until a real cure is found. Perhaps they'd benefit from synergy. This video says that antibiotics are dangerous because they nuke the bodies natural immune system and you got to eat vegetables and drink vinegar. I was not sure exactly what the hell "fiber" is as related to microbes but you got to eat it ... along with vinegar. OK, well I was only using the oregano capsules and the oregano tincture for awhile and no powder mixed with water. Mostly the capsules. As it turned out I could feel it was not enough. I get this strange tightness across my shoulder blades and I get a pain in my shoulder joints from using the mouse on my computer telling me the dose is too weak. So, I have added the powder back that you can see I was using before the oregano and I can see a difference. The oregano capsules are expensive, so I found a powder oregano that I can double or triple the dose for at a cheaper rate. That is, the quality is not as good but I can afford a lot more volume. See photo below. anyway, I wanted to comment about my energy level. From 1-100 I think I am between 95-100 for what has been typical for me. If I get 4 hours sleep it makes no difference. I run around all day and don't take any breaks. King Tut Wrote: "I just don't get why someone thinks he has something to contribute about style for others, let alone on rock climbs he will never touch? " Well ... anyway ... about my physical progress ... they have these climbs at the gym I went to every day for one month. I started out on the 5.8 and now have worked my way up to the 5.11. The 5.11 at the gym are over or under rated. I did all the 5.11-5.8. Now I am working on the 5.11-5.12- I think I will have it in my hiking boots soon. But the problem is that I fear I may still have the bugs. Now, the danger is that my muscles will develop faster then my joints, and then blow them out. So ... I can only go so fast as my joints will allow. So far so good. We shall see what happens as time progresses. But if I get good enough I will prove Tut wrong ... maybe not ... that looks like too much commitment------5.13- is enough for me, when I get there. ITS ALL ABOUT THE JOINTS!!! One thing we now know, is that exercise kills those bugs that live in the joints ... but if you jump up out of the couch then you can do permanent damage. But I do not think you can kill all the bugs in the joints by exercise alone, pretty sure about that. In the mean time, I still eat onions and all that hot junk. The powdered oregano is key. I am taking around 6 pills 2 or three times a day. And I have been taking the powder once or twice a day of oregano and cats claw and Japanese knot-weed. And I use the tinctures. I stay away from sugar and milk and sometimes bread. I think I am allergic to nuts, so I am limiting those to cut down on inflammation. I have a little rose-face I want to see disappear, which I think has something to do with that almond butter. I also take some collagen pills. My brain seems to be working OK, although once in a while I get stuck on some stupid idea for a day. But over all I would say my capacity of higher IQ is increasing. Not sure if Kingtut would agree with that one. 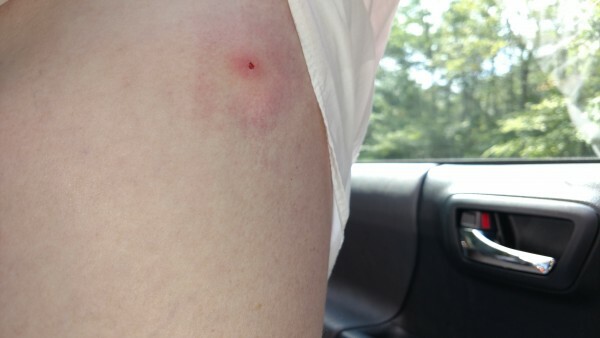 If I get bit again I would not take the antibiotics, although I think I should have started out with them first. I would get it if I thought it would help, but at this point it seems to me that I have zero symptoms, my energy leaves are higher then they ever have been. The only problem I can see this month is that I need to take more powder rather then avoid it. I need to take twice a day or three times, but I don't. In other words, I have an bad attitude when it comes to drinking dirt. And I forgot to mention the breathing. Also, I don't use American Herb and Spice, I use UpNature now. AHS is way too expensive, and they cut it with olive oil - even worse. I think you need to use only what they squeeze out of a load of it if you want to make progress because they use a ton of it to get what they have in those little bottles---I am talking about products like Plant Guru now not AHS. Both are okay if you money is not a problem. Just thought I would bring you guys up to date. I got a little sprain in my wrist for a couple of days. Not sure what that was about but it is better now. I upgraded my medication as you can see in the photo above. Up Nature is affordable, that North American Spice is too expensive, maybe with everything going that way was around $18.00 a day. Not sure what it is now, but it is going to be a lot less using those bags you see in the photos of oregano and Japanese Knotweed. The other companies do not cut their product with olive oil like North American spice does, their one ounce oil mix is $30 and the undiluted 4 oz up oregano was only $21.88 and both have the same percentage of carzalrol, around 65% in the oregano itself. For supper I had hamburger with onions and peppers, garlic, ginger, jalapino peppers, tumeric. I usually put some sea salt and Indian spices on it and then I get some probiotics and hydroelectric acid pill. My shoulders are doing pretty good now, I can sleep on my side. I took break from the climbing gym but I worked today, and I have zero brain fog since before Christmas. If you use that juice, watch yourself, it's really strong stuff. I can imagine if you contracted Lyme it would kill it in one day if you took enough of it. I take some clove bud now and then, but that stuff tastes like floor cleaner and I do not like it. I think that stuff is the strongest junk, even stronger then the turpentine. From what I can figure, I was bit around August 2nd 2017. After feeling sluggish around 2-3 weeks later I realized I probably had Lyme, and then I get the bulls eye. Finding a doctor to answer a questions was impossible on a Friday night, so over the weekend I decided to do it myself. All those guys wanted from me was my money. Looking back I suppose I could have tried that antibiotics and would suggest them to people when they first get Lyme. But those guys what to see blood tests to find out if you have it, when in the only sure way to tell is by symptoms. I have been slacking off on the herbs, not sure if I am ready yet for that. I am just getting lazy. 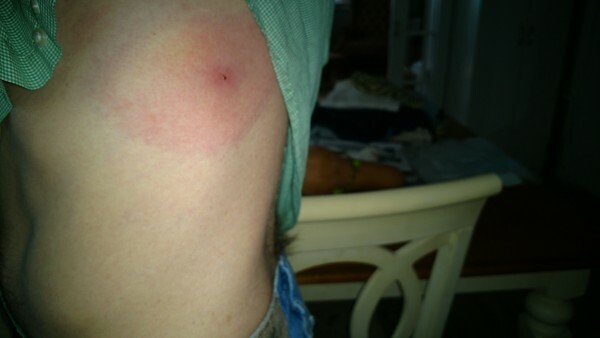 I feel better then before I got bit. The big problem was figuring out how much and what kind of junk to take. I upgraded my medication as you can see in the photo above. Medication would indicate you are taking "medicine".... none of that is medicine, but it *is* a massive assortment of #woo_fukery. Hope you get better... time, placebo, whatever is at play here. 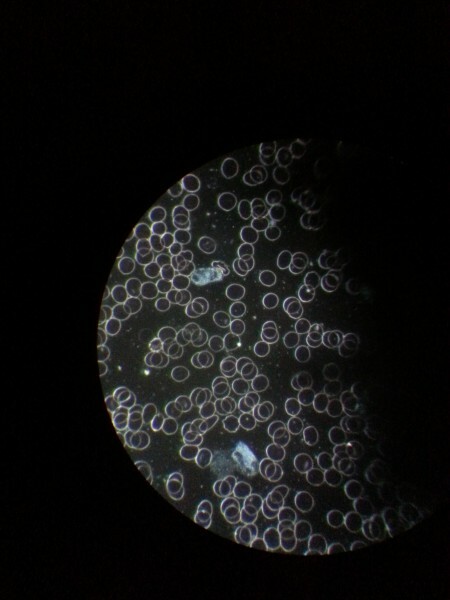 Photo of my blood cells under my high powered microscope. Too bad I do not have that thing now, I returned it. It cost $3,000.00, I am I just going to assume them buggers are in there somewhere now. But don't be jealous, everyone has a few. I cut down on my placebo for a few days and started to get just a tinge of a headache, starting some jaw joint pain, near invisible swelling of the feet all today. Well maybe the swelling of the feet started a few days ago, but it is not real swelling, it just seems like it could be, its hard to explain. You need to know your body I guess. So I need to go back to twice a day and add an extra at 12:00. The good news is that I have no pain in my shoulders for months at a time or brain fog and I can climb 5.11+. Lets see, so now I'll take some turpentine and 10 capsule and some dirt tasting knot weed. I'll let you know how fast I get back to being sick without the symptoms. This time though I am not using the $400 per month pills, I am going down the low road. By this point you may be thinking "Lyme is like this guys toy, what would he do without it?" Well, that would in part be correct, I am toying with it, and I really don't care. But I guess I have to kick it up a notch to make sure the bugs don't eat all my brains. Man, I hate that taste of that powder. Here it goes again! I'll never forget this photo. Russ, do you remember passing me with two guys on the Nose, I was using a cot as a portaledge? No, I think that was John Middendorf instead. Important info: Japanese Knotweed: KW is a systemic antimicrobial that crosses the blood-brain barrier, and it is protective of the central nervous system. It is a particularly good source of resveratrol, the age-defying substance found in grapes and wine that everybody is talking about. But unlike grapes, JKW provides trans-resveratrol, the form most readily utilized by the body. Without knowing it, my dose was too low all this time. I am now doubling it. As for the Antibiotics, when they fail, if they fail the Japanese Knotweed succeeds. KW is a systemic antimicrobial that crosses the blood-brain barrier, and it is protective of the central nervous system. It’s also anti-inflammatory and supports immune function. JKW is a “double duty” supplement that offers many profound benefits beyond antimicrobial properties. It is a particularly good source of resveratrol, the age-defying substance found in grapes and wine that everybody is talking about. But unlike grapes, JKW provides trans-resveratrol, the form most readily utilized by the body. I was not sure if I still had Lyme or not, but now that I slacked off for a week it has become apparent that I still do have them hiding inside me happy with the the twice a day. Going to the doctor is a good idea if you happen to find the right one. Ultimately, you need to know more then the doctor about your own body and what to do and what not to do. I am getting to that point now. If I use the Antibiotics they will not work unless I take enough of my supplements with them to dissolve the biofilms. Stephen Harrod Buhner said in his book that he doesn't care about antibiotics----any reputable doctor who will go the antibiotic route also needs to incorporate the Stephen Harrod Buhner as well. If not the antibiotics may or may not work. I am going to hold off on the antibiotics for the time being. Sorry about your loss Lynne, it must have been a tough ride for Dan---so sad.